The girls got a ton of wonderful presents this Christmas. Including several things we haven’t tried yet – like puzzles and games. Yesterday two of the three girls were too sick to take to Church, so we ended up with a quiet day at home. MG started to perk up in the afternoon, and wanted to try the Magic Science Wizard’s Kit my brother and his girlfriend had given her. After some setup time and enforced “read the instructions” time, they were set to go. They had so much fun! 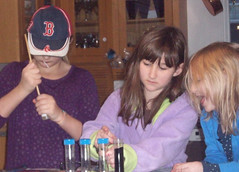 They started by making a wand with magic purple crystals inside. Then moved on to invisible ink, a crystal ball, and the piece de resistance: explosions! 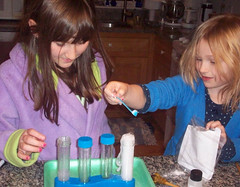 OK, so they were really just test tubes bubbling over, but they loved that so much! I don’t think they could have been happier with this present unless there was fire involved! They started to make a webshow out of the science fun, but unfortunately it kept getting interrupted. It was quite a good attempt, though MG thought they would be a “one hit wonder”, lol. 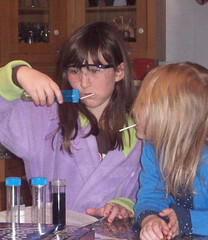 MG looked great as a mad scientist in safety goggles paired with her purple robe, too. Out of the three girls, MG is the most precise, which makes her perfect as a scientist and as a cook. She had to stay home from school today (can’t go to school until you’re fever-free for 24 hours), and spent an hour very careful following a cookie recipe. Personally, I prefer cookies to magic wands, so I’m happy to push her in that direction… I remember when she created the fluffernutter cookies three years ago! Wow, they grow up so fast.